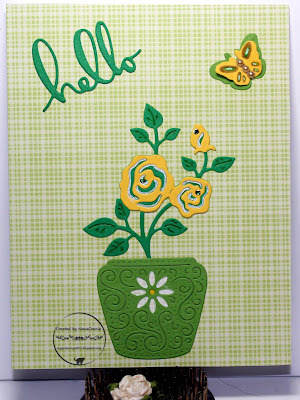 For this one, I cut the roses twice, one green and one yellow, using a die from Cottage Cutz. The plant pot was cut with a Cheery Lynn die, and the butterfly (both layers) is Impression Obsession. The "Hello" sentiment was done with a Poppy Stamps die. I had a scrap of pale green, checked, dp which I used for the background. For the roses, I cut the flowers off the yellow die cut and layered them onto the green die cut. I used white gel ink to highlight them and added tiny gems for a touch of sparkle. I used the gel pen on the pot as well. 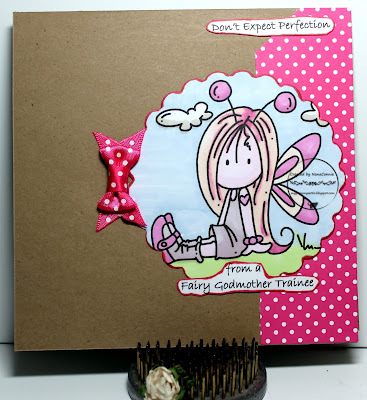 The butterfly was highlighted with pencil and gel ink before adding gold pearls to the body. The sentiment was added last. I wanted the die cuts to be the focus so no ribbons, no 3D flowers, no embellies, just the dp and the die cuts for something CAS. 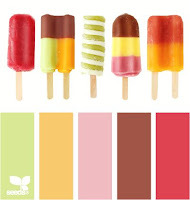 That's all I have for this hot summer day. We've already had more 100F+ days in a row than we normally have all summer long so I'm done with summer! I'm ready for rain, cool days, falling leaves, and something better than the weathermen saying, "105 again today." Yuck. 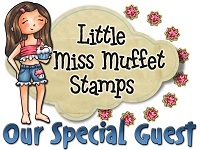 VICKI from Stamped Smiles !! Woohoo, Vicki. 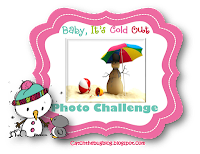 Please send your mailing address in an email to ChallengesForDays@yahoo.com and mention that you are the winner from NanaConnie's blog. This is going to be a really fast post this morning. 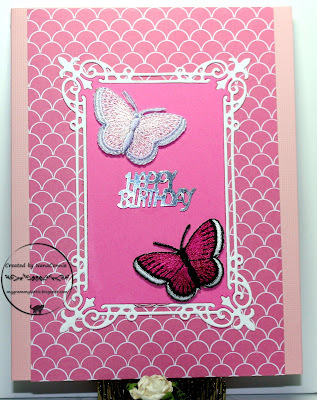 I'm back to machine embroidered things which I can use on cards and this morning, it's pink butterflies! My youngest grandson is a Type 1 diabetic and that can make even ordinary childhood activities somewhat difficult. Even a week away at summer camp is nearly impossible, to say nothing of being outside the family budget given the extremely high medical costs which they bear every month. But this year, one of the college sororities gave two scholarships for Type 1 kids to attend a camp specifically for diabetics and he got one of them! Hooray! He had the most wonderful time. 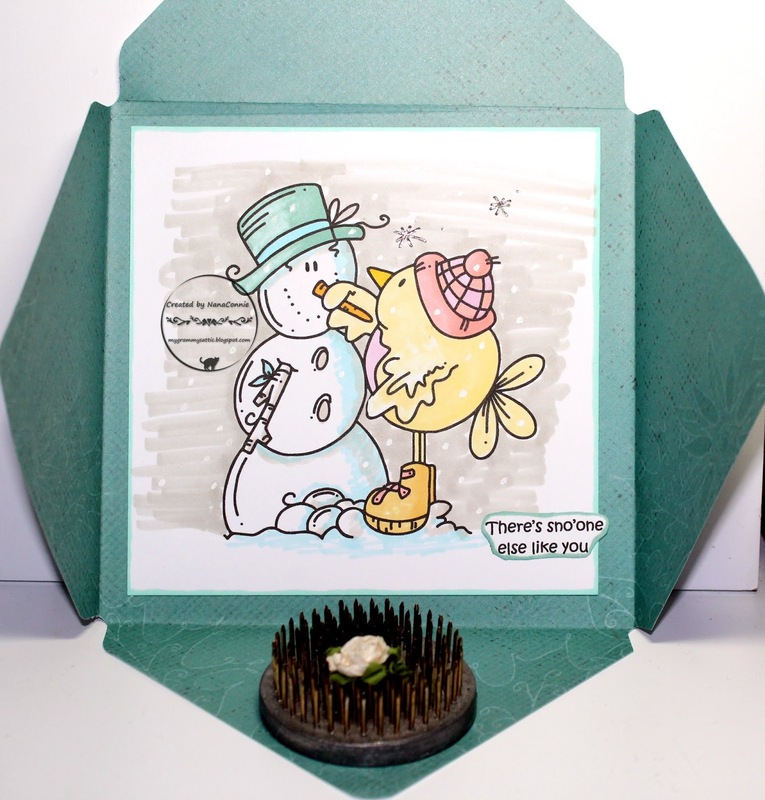 Today's card was one I made for him and he's putting his "Thank You" letter to the sorority sisters inside it. I didn't know kids in this day and age of texts and email communications would even think about something like a written Thank You but I'm proud of him for doing it. He's twelve, BTW. !!! 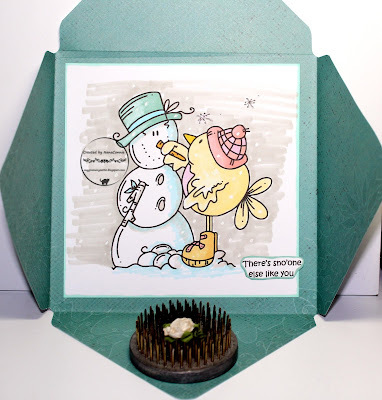 The image is an old one from Doodle Pantry which was pre-colored but I added highlights, ground, sky, and green on the trees with ProMarkers and chalks. I cut the image into a rectangle and then corner punched it. I added three tiny buttons to it and put it on a beige card front. I wrapped twine around the card and tied it into a bow. 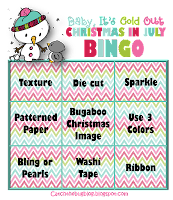 It's Day 5 and I've managed to enter each and every day of the daily challenges at Catch the Bug's Christmas in July. Today's theme is "Make it Funny" and there's an inspiration photo which can also be incorporated. I chose this fun image and made up my own sentiment to go with it. I colored the image with ProMarkers and colored pencils plus a bit of glittered gel ink on the cocktail glass and liquid. I cut it with a square die from QuicKutz, then distressed the edges with a craft knife blade. I dug through my scrap basket and found the papers, distressed the edges of the red one and curled one corner. I printed and fussy cut the sentiment, distressed the edges lightly. 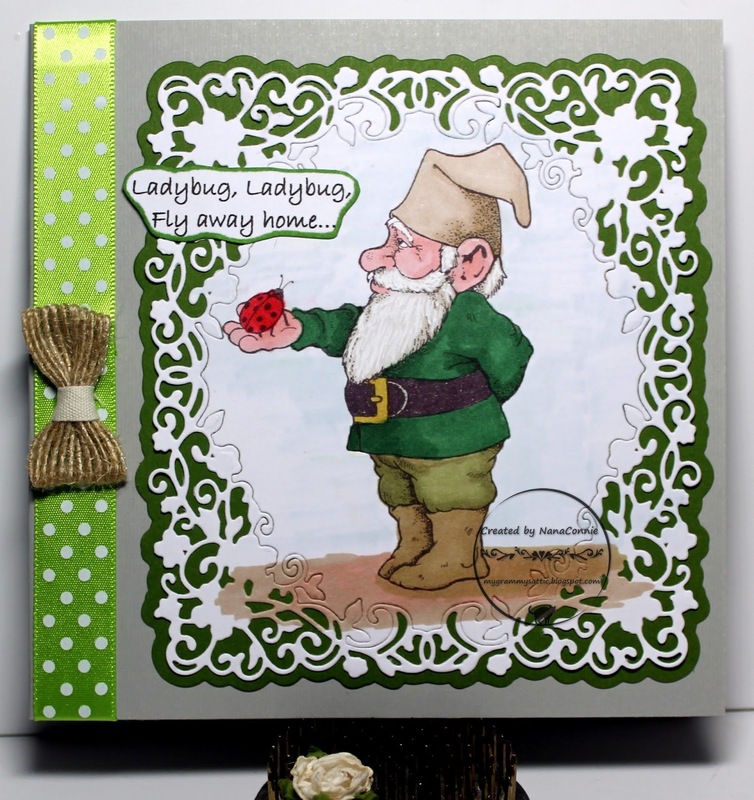 The ribbon and bow were waiting in my stash and they seemed a perfect final touch. Many of you know that I handle and update one of the challenge lists at Challenges for Days, a site which gives you lists of challenges and their themes for every day of the week and for "by the month" dates. If you go to the Challenges for Days site, you can sign up to follow and you'll never miss the daily list of challenges ever again! We are celebrating our 5th Birthday with quite a collection of fabulous prizes. Starting today and ending on Saturday, July 28 (our actual 'birthday') there will be 1 daily winner and 4 super winners on Saturday. I have a prize which I've donated for the daily winner today. 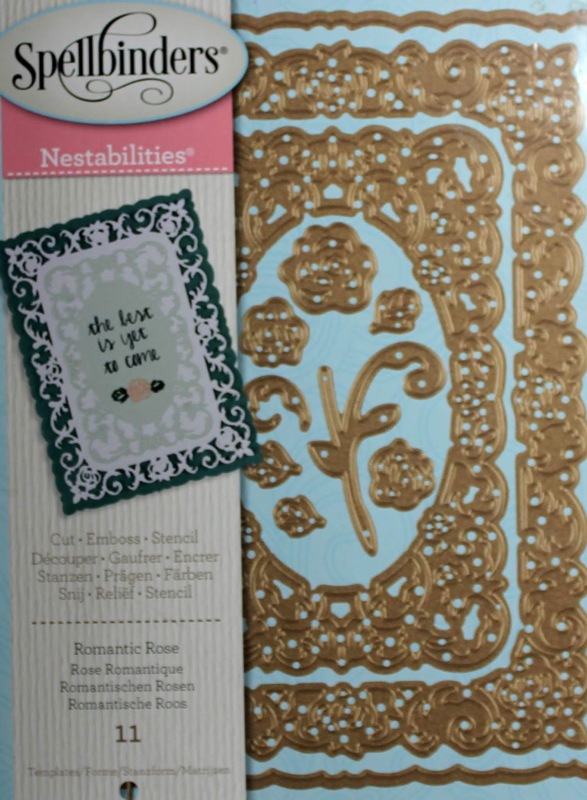 I'm giving away a Spellbinders die set, "Romantic Rose" (see photo at end of post) which will be mailed to the winner. 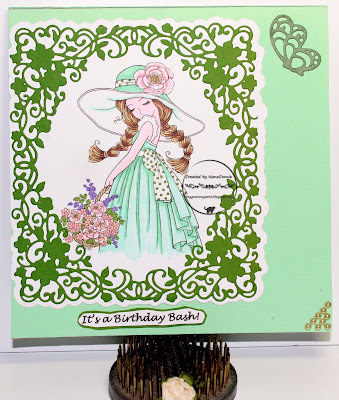 Just leave a comment here on my post and on the Birthday Bash post over at Challenges for Days, and you could be the winner of today's prize. The image is from Conie Fong and I colored it with ProMarkers. 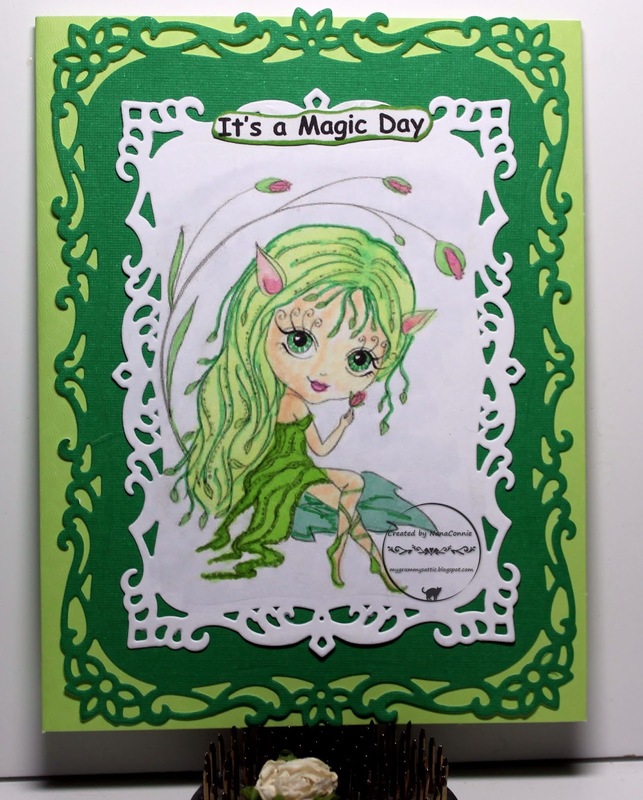 I cut the image with a die from Sue Wilson and the green framing was cut with another Sue Wilson die. Even the butterfly is a Sue Wilson die. I added rows of pearls to the corner and printed the sentiment, matted it, and adhered it below the image. 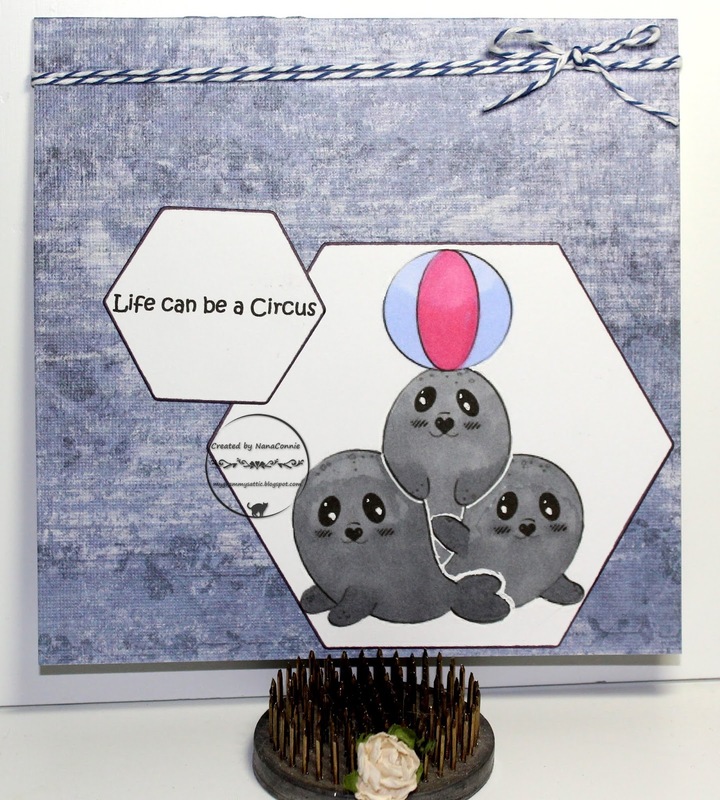 Prize for the giveaway - leave a comment! 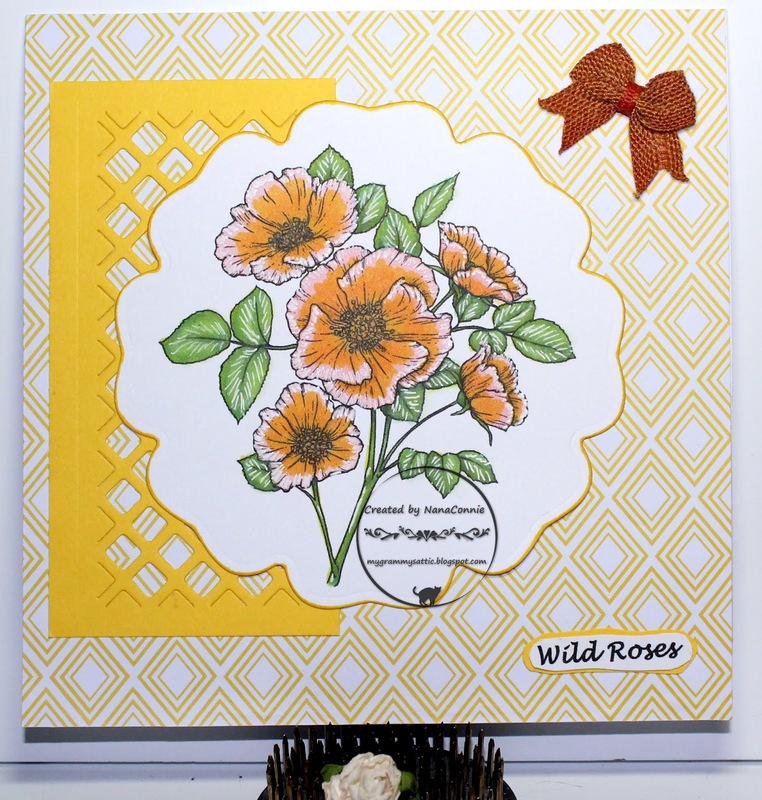 I used ProMarkers and water colors to color the image, then used Sue Wilson dies to cut the image and the delicate, flowery, frame. I inlaid the image into the frame and matted them both with a die cut piece of green CS. 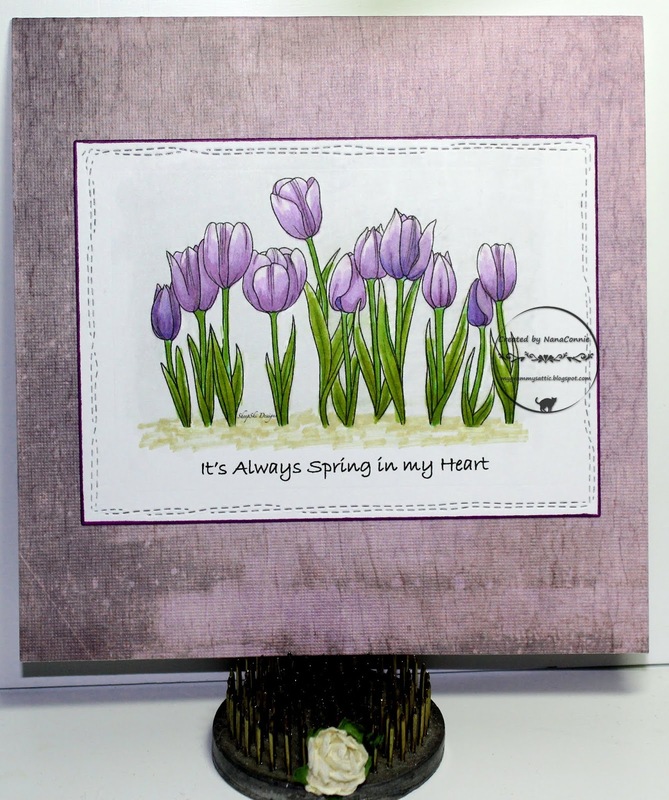 I printed and matted the sentiment before adding that entire piece to a "linen" embossed card front. The polka dot ribbon came from my stash and I dug out one of the wrapped, burlap twine, bow tie, bows that are in my basket. I made several dozen of those over a weekend and am still finding them useful when I want a bit of extra texture. I adore this sweet image (Mo Manning) and this is the first time I've used it as a Thank You card. I needed one on the spur of the moment and this image was lying on the desk, waiting to be colored. 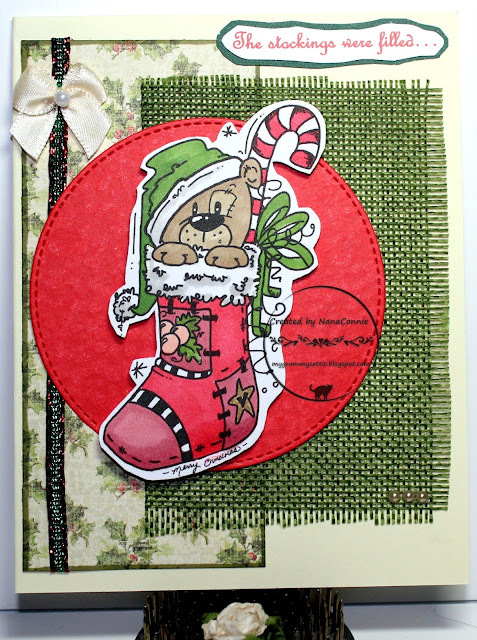 I used a Fiskars corner punch on both the image and the piece behind it. 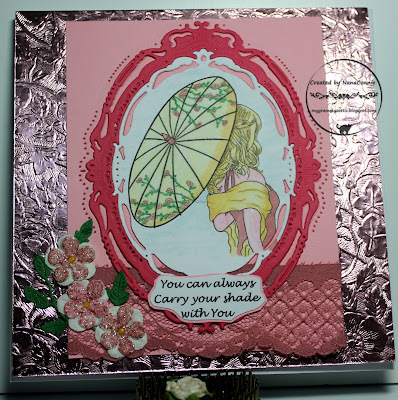 I mounted everything onto a pink card base. 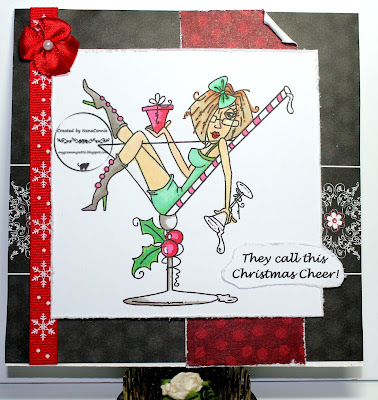 The sheer ribbon was in my scrap stash and I used up what I had left. Rather than tying a bow since I had such a small piece left after wrapping it around the card front, I simple folded it into a bow shape and added a sparkly flower to the center. I used ribbon glue to add it to the corner of the image. It's another Friday and another challenge starts at QKR Stampede today. This post is another pre-scheduled one but I don't think you'll mind. 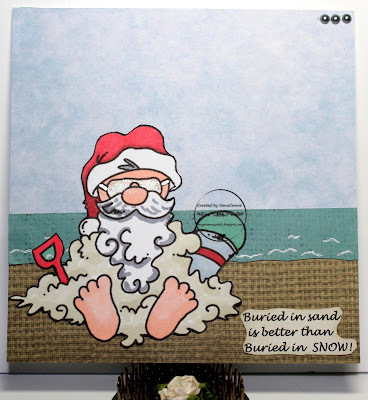 I know I have a few blog buddies who always stop by on Fridays to see what kind of silliness I've produced with the QKR image for that day. And I know my friend, Lynn, will love this one if for no reason more than the blue color combo. Today I've played with "Happy Tummy" and this card is going to a diabetes diet technician in my doctor's office. I know that sentiment will put a smile on her face. 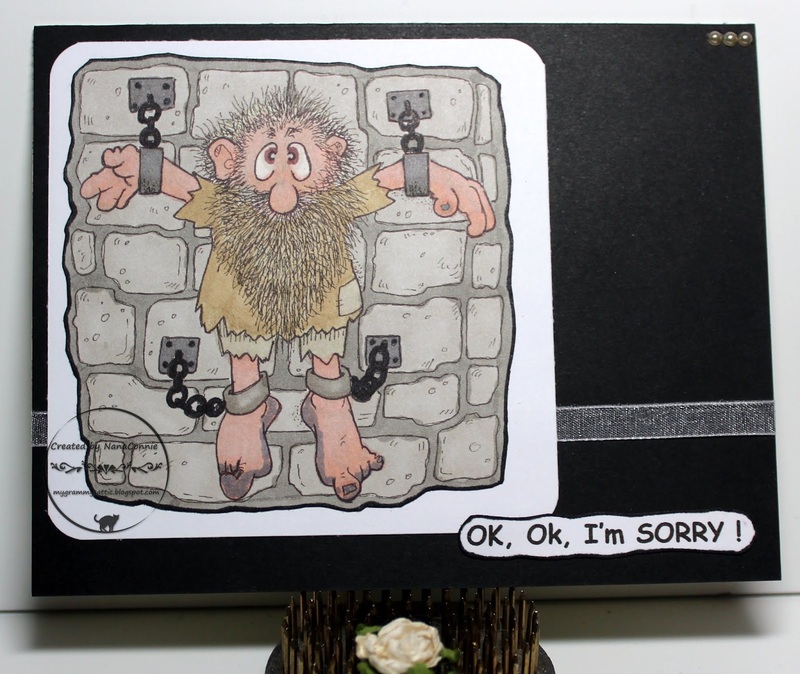 :-D.
I used ProMarkers to color the image, then cut it with a stitched die from CUTplorations. The polka dot dp is a scrap rescued from the basket, and the background plaid was a leftover exactly the right size for this card base. I printed the sentiment, hand cut it, and inked the edges. I found some navy-blue, jute cord and tied a double bow, then added it to the image piece. 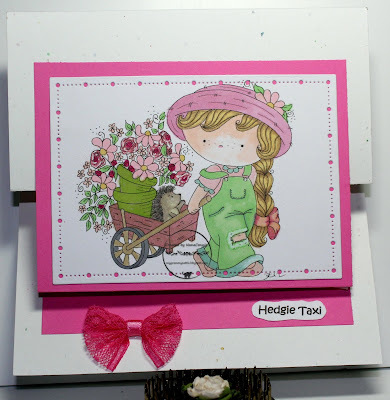 I love this adorable image from Di's Digi Designs which makes me think of a taxi ride for a hedgie. This little girl pulling her garden cart is so sweet. I did something new for me - a Double Z Fold card. Here's a side view photo to show how the two pieces are put together. I colored with ProMarkers and watercolor pencils, then cut the image with a Gina Marie die. I layered the image onto the top portion of the pink CS, and scored it twice to make the Z fold. I took the white confetti CS (5 3/4" x 11"), scored it twice, and folded it into a larger Z fold. 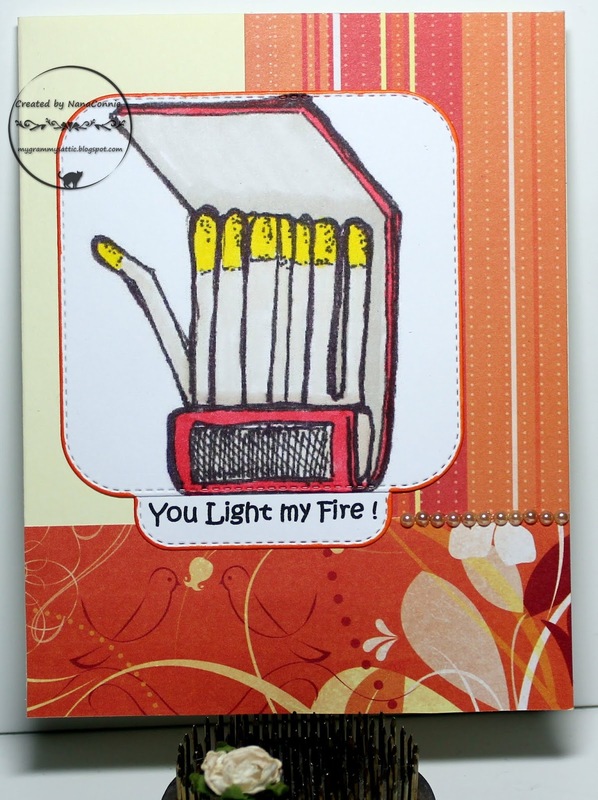 The largest part (below the middle fold) is 5 3/4" x 5 3/4", making it a square card when all is folded together. It will fit perfectly into a 6" x 6" envelope. 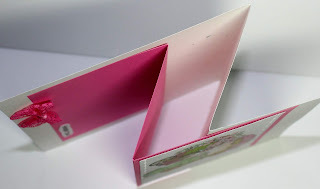 I put the two Z fold pieces together, using double sided tape first at the top of the card, then folded them up together to determine where the bottom of the pink CS should be. Once I had that, I removed the covering strip from the double sided tape on the bottom of the pink CS and pressed them together. I tied a bow tie bow from a bit of leftover lace, wrapping the center with satin ribbon and I added that to the bottom of the pink CS. I printed the sentiment, hand cut it, and added it to the bottom of the inside Z fold. It took me a little experimenting to figure out how to do the Double Z fold but I quite like it and will undoubtedly do more of them. I used the sketch from Stella Says Sketch. 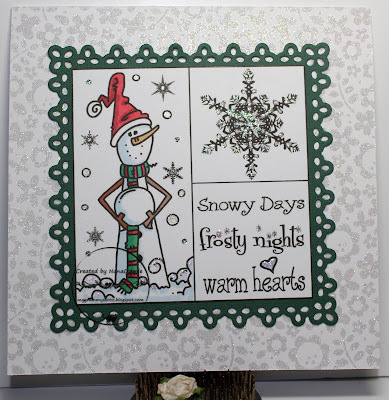 I colored with ProMarkers and gel inks (white, silver, and sparkle), then die cut the image and the frame with two of my new dies from Tonic Studios. I found scraps of dp in my basket, cut the ends of them with one of the scalloped dies from Tonic Studios, and added them underneath the framed image. I tied the multi-loop bow using two ribbons on my bow maker. Finally, I printed the sentiment, hand-cut it, matted it, and added it, offset below the image. Is this a marvelous image? I think this may be the most CAS card I've done ever! 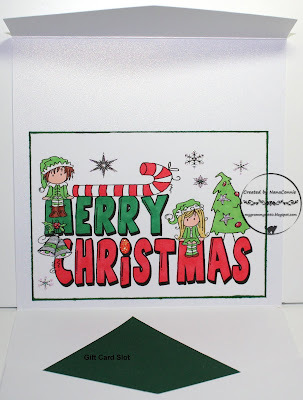 I do like CAS and try to do simple designs pretty regularly but this is literally nothing more than the image adhered right onto the card base. I used ProMarkers to color the tulips and to make a bit of a scene by adding ground and very pale sky. The sentiment is printed right with the image. I cut it with a stitched die from Lawn Fawn and added a bit of marker ink to the edges. 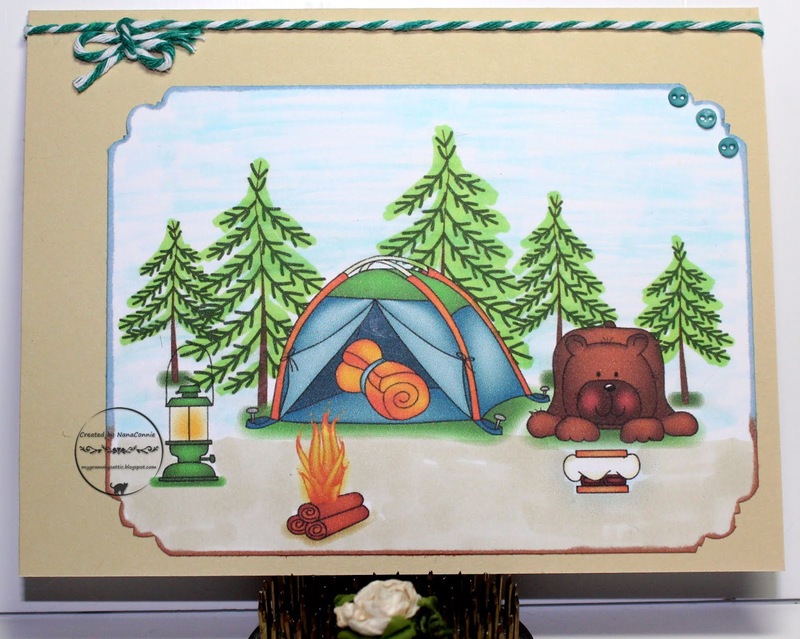 The card base is single sided, 12"x12", distressed, scrap booking CS which I cut to size and scored to make a tent fold card. 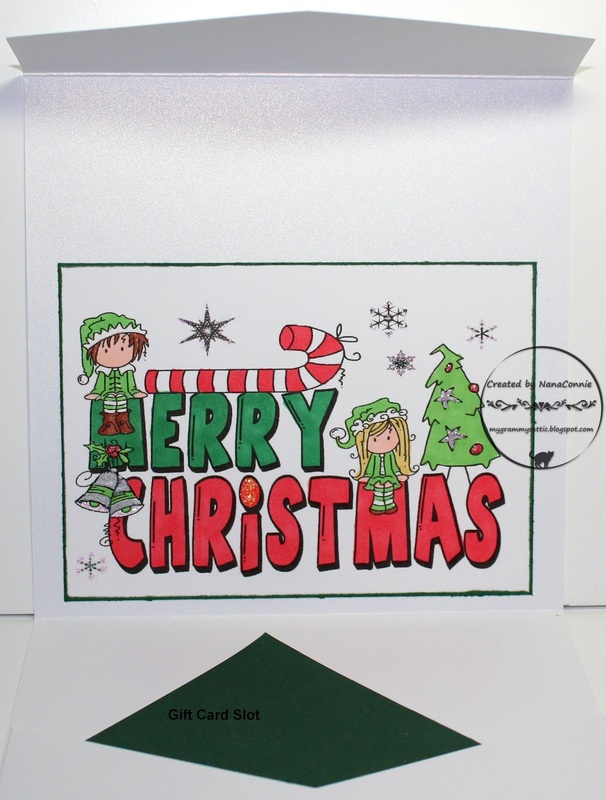 No embellishments - no ribbon, no flowers, no bows, no bling... just the die cut image and the card base. I like it! It's another Friday and another challenge is starting at QKR Stampede today. As usual, our theme is Anything Goes. There's no requirement that you use QKR images for your project but if you do, then your entry will be in a separate draw and your chances of winning are huge! This morning, I let my quirky sense of humor run wild and here's the result. 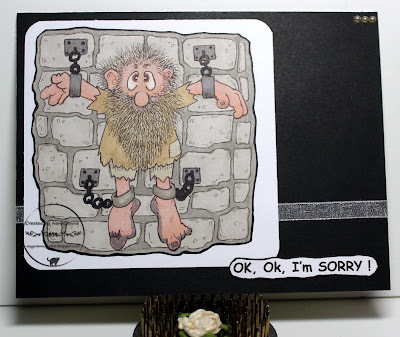 I colored the image with ProMarkers, then cut it with a die from Cheapo Dies. 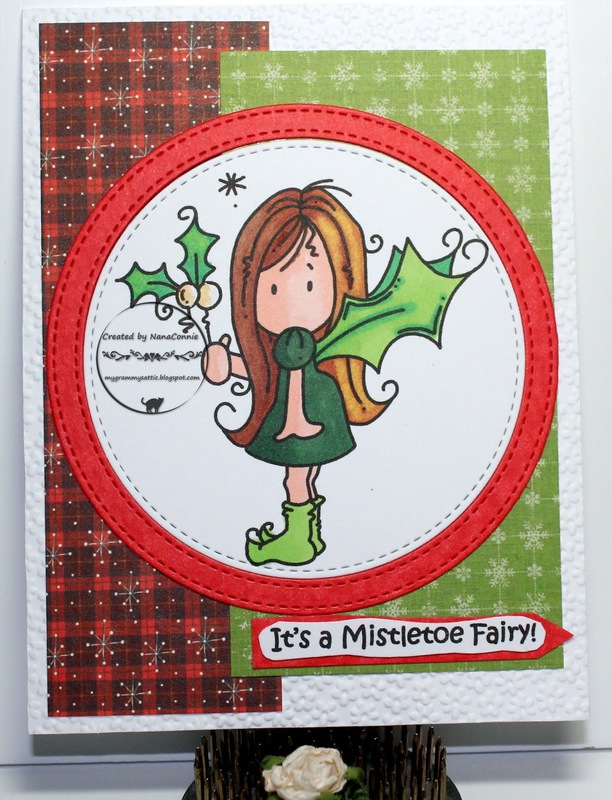 I used black CS to make the background, added a sheer, sparkly ribbon, and layered on the image. I printed the sentiment, hand cut it, and added it to the card front. For a final embellishment, I added the three tiny pearls to the top corner. Happy 4th of July! Hope your is safe and sane. This morning, I'm sharing a card with an image from Sasayaki Glitter for their Progressive Challenge on FB. I colored with ProMarkers (don't you love my subtle red, white, and blue? 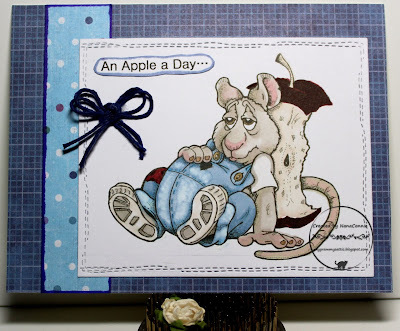 ), and cut both the image and the sentiment with dies from QuicKutz. I inked all the edges and layered them onto dp from a large, 12x12, DCWV stack. I added the baker's twine and CAS card which can be mailed easily. If you ask my dear SIL, he'd tell you that Summer Tea Time was actually Summer "Tee" Time on the golf course! But when I think of Tea Time in the summer, I remember delightful afternoon teas in the garden when I was an exchange student at Cambridge University in England. I have delightful memories of that whole experience, despite the long hours of classes and studies. adjusted for a square card. 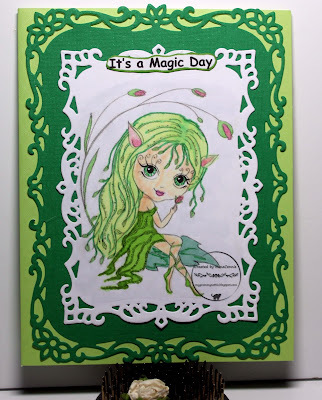 The images (by Sandi Huggett) were printed individually, then colored with ProMarkers. 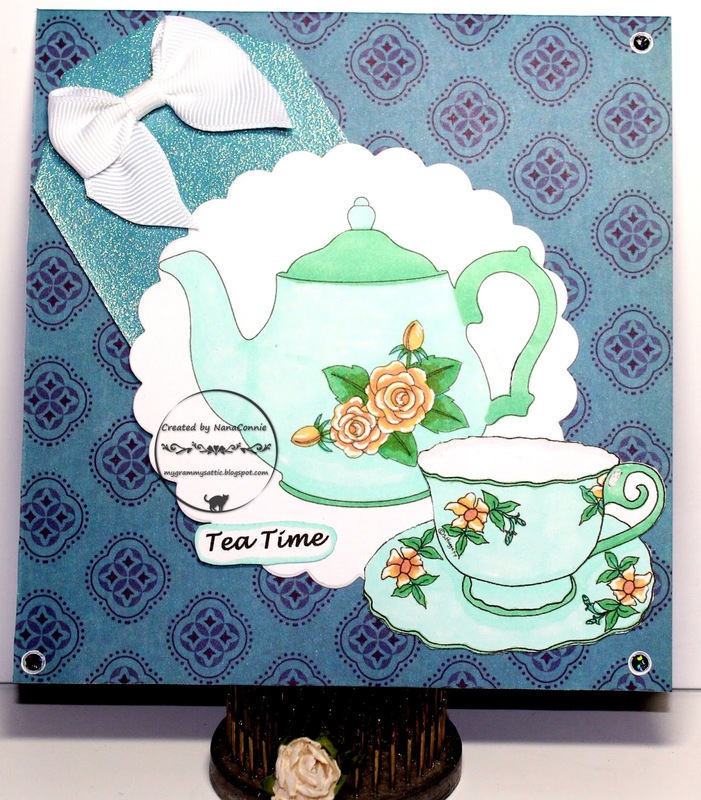 I fussy cut the teacup, and used a scalloped circle die from Spellbinders to cut the teapot. 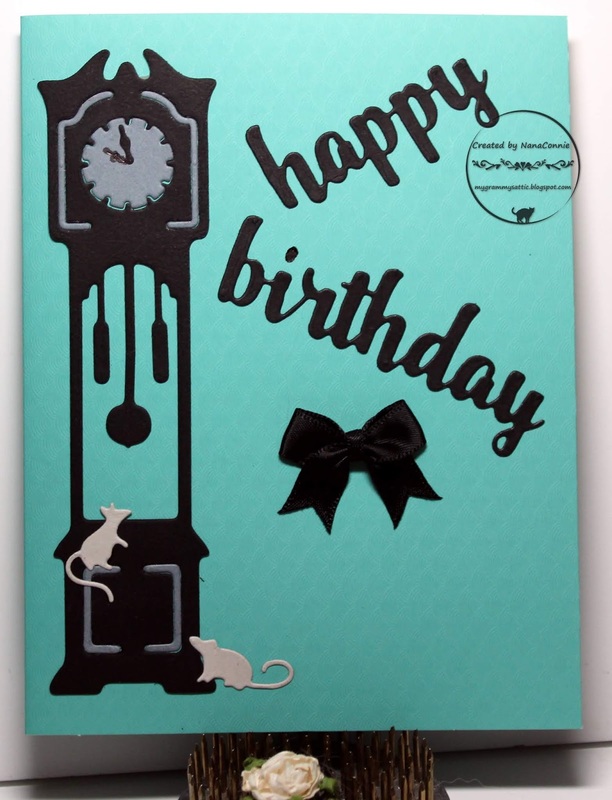 The background dp was a leftover of scrapbooking paper and I love the print. It has such a delightful vintage feel to it which seemed to work well with the 'Old World' tea set. Have you ever wondered how Fairy Godmothers get their skills? Like any truly great, magical creature such as warlocks or wizards, they are required to go to school and serve as intern/trainees with older, more experienced, fully accredited, Fairy Godmothers. Yes, it's true! And, sadly, there are mistakes and mishaps at the famous fairy school, Nowarts, just as there are each school year at Hogwarts. 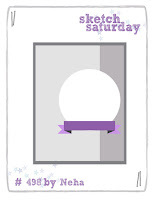 The Fairy Godmother Trainee on today's card comes from Bugaboo Stamps. I was inspired by sketch #498 at Sketch Saturday. 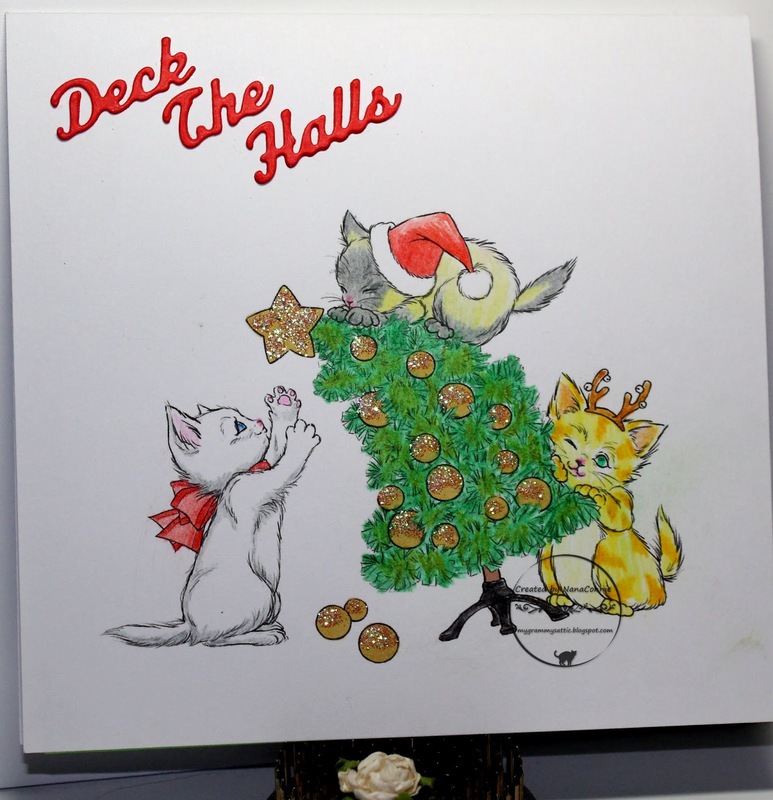 I colored with ProMarkers, and cut the image with a scalloped circle die from Sizzix. 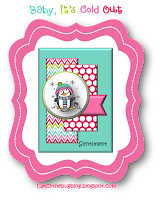 I found a scrap of bright pink, polka dot dp and added it for a pop of color. The sentiment was printed, hand cut, and inked on the edges. I tied one of my bow tie bows, using complementary polka dot ribbon. There you are, a fast and simple card design that took about 20 minutes to make after the coloring was done. This is my second post of the day and, in my first post, I promised you wonderful news if you stopped by again. So here it is: I've rejoined the DT at SheepSki Designs!! And, yes, I'm excited to say Andrea took pity on me and said "Yes" when I begged to return. :-D Thanks, Andrea. Our challenges are always "Anything Goes" but we also offer an optional theme with each challenge, which you can use or not, your choice. I followed the theme this month "For Someone Special." I'm sending this to a friend who needs some emotional support and encouragement, and that in itself makes her very special. My first card today was very CAS so with this card, I went to the other extreme. The image was colored with ProMarkers, the cut with a die from Spellbinders. The darker pink frame was also cut with another die from that same set. The lighter pink CS was embossed and pinpoint punched around the frame. 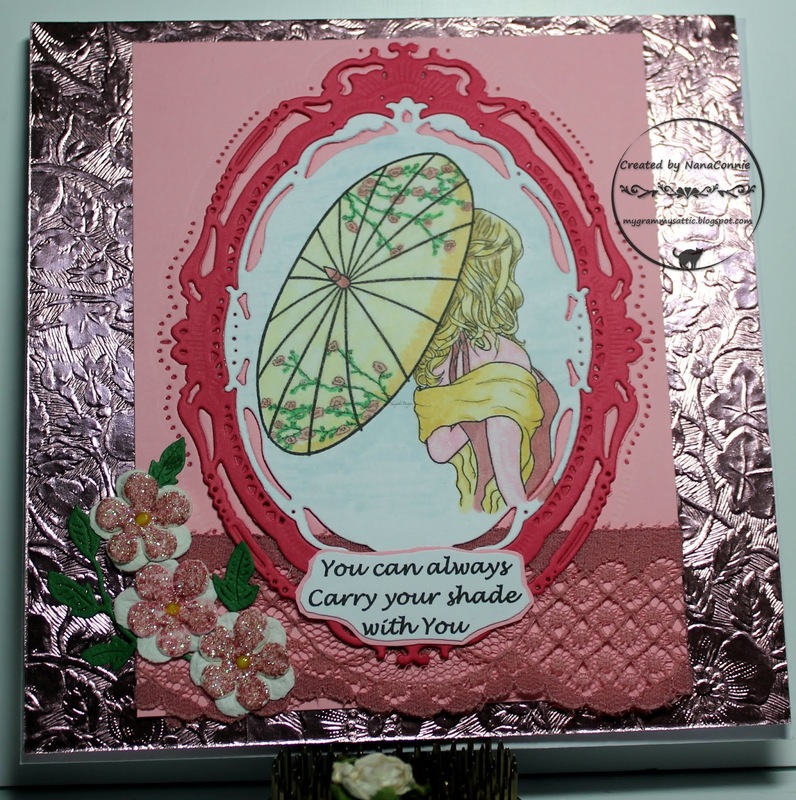 I added lace to the bottom of the light pink CS, then I added the image piece. 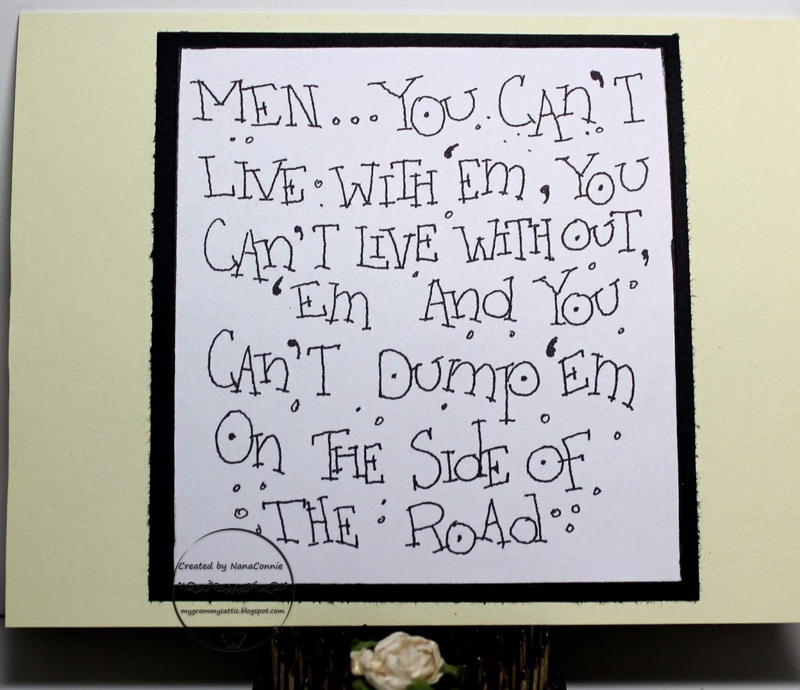 I printed and hand cut the sentiment, matting it with a scrap of the same light pink CS. 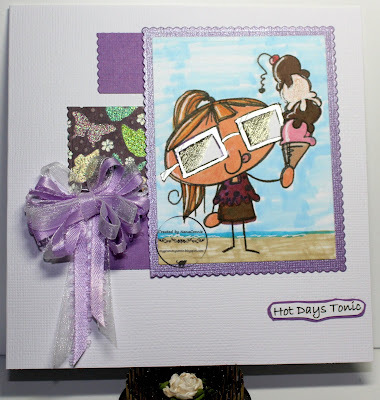 I covered the card front with embossed, metallic paper and then added the framed and matted image on top of that. Looking for embellishment on this already 'fancy' design, I dug through my box of flower and leaf dies, found a flower die from Spellbinders and a leaf die from Cheery Lynn. I used those cut the flowers and leaves. I added pink glitter to the top layer of flower petals and put a tiny dot of yellow Nuvo Crystal Drops in the center of each flower. I apologize for the photo quality but the metallic paper, which is so gorgeous IRL, made it very hard to photograph so this is the best I could do, even with photo editing.